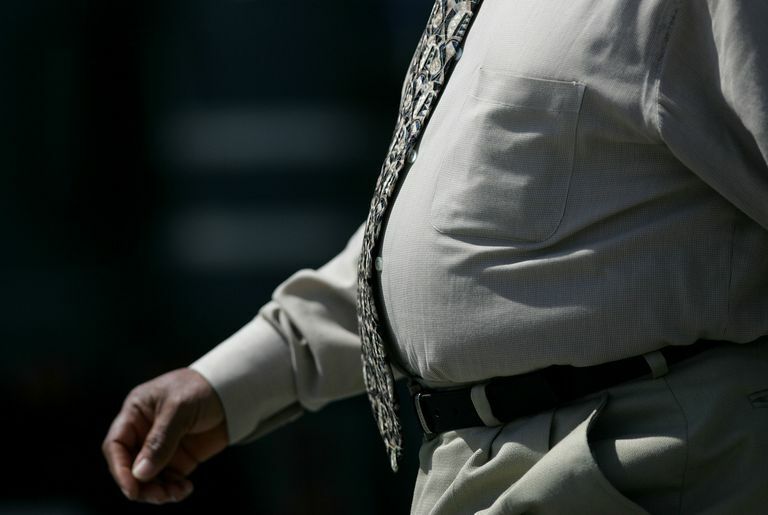 People who are obese are at much greater risk than others for type 2 diabetes. Recently, however, research has demonstrated that it’s not weight alone that increases health risk—it’s where that weight is located. Extra weight around the midsection is called visceral adipose fat or abdominal fat. Less scientifically speaking, it is known as a beer belly, love handles or being apple-shaped. Carrying extra abdominal fat has been shown to significantly increase the risk of developing resistance to insulin, which can lead to diabetes. It also increases the risk of high blood pressure. People most at risk for developing type 2 diabetes are those who have a high body mass index (BMI) as well as a high waist circumference and a high waist-to-hip ratio. The BMI is a number based on height and weight. It provides a general idea of the total amount of body fat. The more fat, the greater the health risk. A BMI between 18.5 and 24.9 is considered normal. You can estimate yours using a simple calculator. However, because the BMI may overestimate body fat in those with muscular builds and underestimate body fat in older people, it alone is not a good indicator of health risks. In addition, some people with a normal BMI may still be at risk for diabetes if other risk factors, such as being Native American or African American, are present. Several studies have found that waist circumference – the measurement around your waist above your belly button and below your rib cage – is another predictor of risk of diabetes. In general, men are considered at risk if their waist circumference is more than 40 inches, women if their waist circumference is more than 35 inches. Those with BMIs above the normal range and a waist circumference are at greater risk for developing type 2 diabetes, according to a study to be published in September in Public Health Nutrition that followed male and female subjects for a 10-year period. Waist-to-hip ratio (WHR) can be another risk indicator. A WHR of 1.0 or higher puts people at greater risk for diabetes and other health problems. According to the CDC, a ratio of 0.9 or less for men and 0.8 or less for women is considered safe. The University of Texas Southwestern Medical Center website has an easy-to-use waist-to-hip ratio calculator. How Do You Get Abdominal Fat? A sedentary lifestyle and a diet high in carbohydrates, full-fat dairy products and saturated fat from red meat contribute to abdominal fat. Eating a healthy diet with a high proportion of fruits, vegetables, and other high-fiber, low-fat products can help reduce excess abdominal fat. Adding cardiovascular activity – something as simple as walking 30 minutes each day – can also trim down a spare tire. Substituting a modest amount of protein from chicken or fish for some of the carbohydrates in your diet can also be beneficial, according to a study conducted by The American Society for Nutritional Sciences. The trick here is to do so modestly and not go overboard into a full-fledged, low-carbohydrate diet. Working with healthcare providers or nutritionists can help those with diabetes make safe choices. To achieve the best results, people with diabetes should talk to health care providers about adjusting both diet and activity levels. People who exercise regularly experience significant improvements in insulin sensitivity, allowing them to use the insulin they produce more efficiently and lower blood sugar levels. Balka, B., P. Picard, S. Vol, L. Fezeu, and E. Eschwège. "Consequences of Change in Waist Circumference on Cardiometabolic Risk Factors Over 9 Years." (2007). Diabetes Care. 30: 1901-03. 9 Sep 2007. Diaz, V.A., A. G. Mainous, R. Baker, M. Carnemolla, and A. Majeed. "How Does Ethnicity Affect the Association between Obesity and Diabetes?" (2007). Diabetic Medicine. 9 Sep 2007. Goodpaster, B. H., A. Katsiaras, and D. E. Kelley. "Enhanced Fat Oxidation Through Physical Activity is Associated With Improvements in Insulin Sensitivity in Obesity." (2003). Diabetes 52:2191-2197. 9 Sep 2007. Hirani, V., P. Zaninotto, and P. Primatesta. "Generalised and Abdominal Obesity and Risk of Diabetes, Hypertension and Hypertension-Diabetes Co-Morbidity in England." (2007). Public Health Nutrition. 9 Sep 2007. Merchant, A. T., S. S. Anand, V. Vuksan, R. Jacobs, B. Davis, K. Teo, and S. Yusuf. "Protein Intake Is Inversely Associated with Abdominal Obesity in a Multi-Ethnic Population." (2005). The Journal of Nutrition. 135:1196-1201. 9 Sep 2007. See, R., S. M. Abdullah, D. K. McGuire, A. Khera, M. J. Patel, J. B. Lindsey, S. M. Grundy, and J. A. de Lemos. "The Association of Differing Measures of Overweight and Obesity with Prevalent Atherosclerosis: The Dallas Heart Study." Journal of the American College of Cardiology. (2007) 50:752-9. 9 Sep 2007. How Can Diabetics Use the BMI Chart to Monitor Their Health?